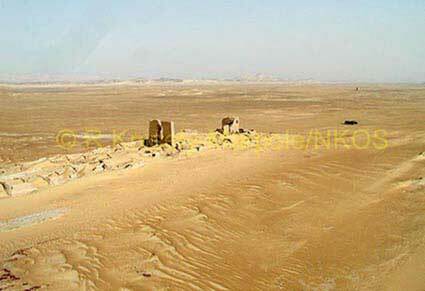 The sand-blasted remains of the temple of Ain Dabashiya stands to the height of several metres in a rather bare landscape. They are filled and surrounded by a cluster of later enclosures, and by the remains of extensive cultivations. To the north of the complex, there is one of the best-preserved pigeon towers of the entire Western Desert. As with Ain el-Tarakwa, Ain el-Dabashiya has never been investigated and is virtually unknown.